Once upon a time, a rather eccentric group of characters were gathered on the patio for a rather extraordinary party. Is this the beginning of a stori from long ago or your near future? Look as the redheaded queen presides over her royal court. Or is she the jealous step sister? A man in a curious hat laughs and lets the cards fall where they may. The prince sits there as if under a spell – or perhaps he’s just sleepy? And who’s that grinning at the foot of the table? It’s a mad scene, to be sure, but this is only the first chapter. And there’s no telling where this stori may lead. The Fairy Tale Collection from Stori Modern begins with a few familiar lines, but where it goes from there is entirely up to you. 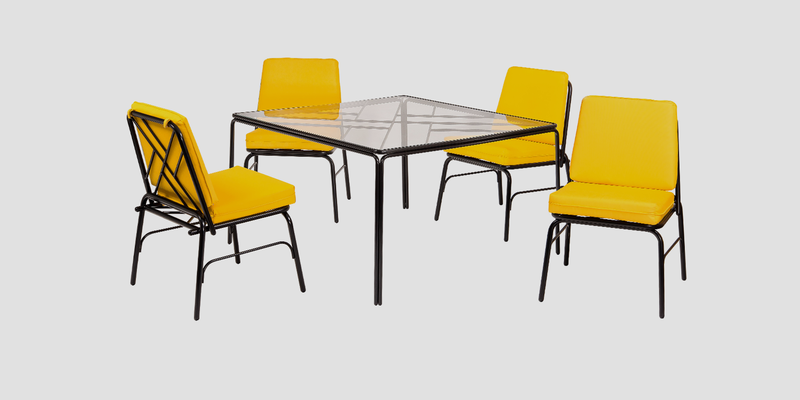 Tubular steel crisscrosses beneath brightly colored cushions like an intricately woven fable. Armed chairs stand guard over the dining table. Side chairs gossip with the ottoman. The coffee table holds a cup of tea while the lounge chair just sits there, relaxing. Oh, what will happen next? It’s a classic stori, reinterpreted for a contemporary audience. So go on, take your place at the table and begin choosing your next adventure.